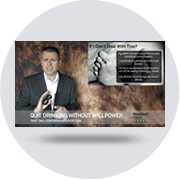 The Stop Drinking Expert 'Executive VIP' option is designed for clients looking for the most effective and quickest solution to problem drinking. 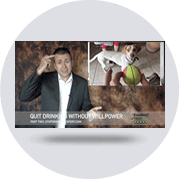 Instant access the the world's only Trustpilot approved (5-star rated) quit drinking program. With daily video modules and exercises. The course starts with a one hour video coaching session with Craig Beck. Plus on going support and advice with Craig as your personal mentor. 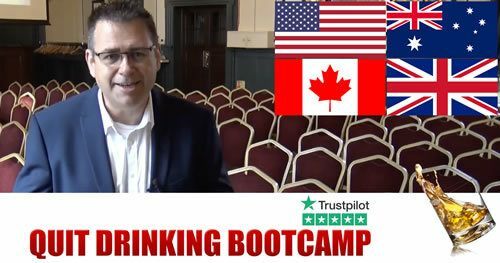 Quit Drinking Bootcamp is our full day live seminar. Held once per month in locations around the world (including United States, United Kingdom, Canada and Australia). 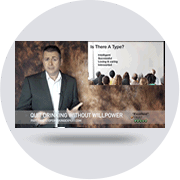 As an Executive VIP client you get free access* to all Quit Drinking Bootcamps for life. 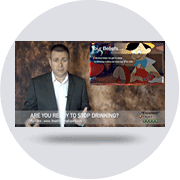 “The Stop Drinking Expert program is the world's only 5-star rated online course helping people to get back in control of their drinking. Over 100,000 people are now living happy sober lives as a testament to just how effective and easy to follow the process is. However, if after test driving the course you are not impressed with the results I will refund your money in full. The only condition is that you genuinely gave it your 100% passion and commitment. 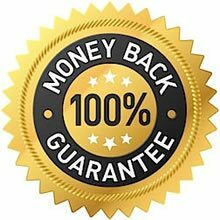 You must have completed the daily modules and homework assignments to qualify for the refund.”, Craig Beck DhP. ABNLP. You have probably heard the story that quitting drinking is difficult and unpleasant. However, there is an excellent reason why every attempt to control your drinking so far has failed. We start the course by bursting the bubble of unreality that surrounds this drug. All is not what it seems, and this part of the course will reveal some shocking truths. The thought of quitting drinking may feel scary. Despite all the damage it is doing to your life there may be an overpowering fear that life without it will be worse. We deal with this in Part Two of the complete online course. Alcohol is playing a powerful and deceptive game, and you can't decide what course of action to take until you see how the illusion is being performed. All drugs use a combination of carrot and stick to keep addicts in the loop. In this intelligent approach to how to stop drinking we break the process up into two easy to understand parts. Dealing with the chemical addiction (cravings etc) and then the psychological addiction. For example, you probably have created an subconscious link between relaxation and alcohol - this is where we start to break these false associations apart. Ivan Pavlov is famous for his psychological experiments with his dogs. He discovered he could manifest a physical response in his dogs by anchoring a powerful event to the sound of a bell. You have spent the last few decades link alcohol to all sorts of things like relaxation, sleep, confidence and be sociable. Thankfully Pavlov worked out how to 'unprogram' his dogs and I know how to 'unprogram' you. This course is for problem drinkers and not alcoholics. The difference being 'problem drinkers' are in a psychological loop with their drinking rather than being physically addicted to the drug. My members usually are holding down a job, in a relationship and maybe even be parents. All the horror stories of alcohol withdrawal are not applicable to my members - in part 5 I show you why you have nothing to fear from quitting drinking. Part six is a real lightbulb moment for many members. This is where the penny really drops for so many problem drinkers. From this point quitting alcohol actually feels like it's not only going to become a part of your new reality but it will be something you enjoy and take ownership of. Here in part 6 of the online course we look at the real cost of drinking this attractively packaged poison and start to plot out your own happy sober life. At a live Quit Drinking Bootcamp we talk a lot about our reason to drink. More often than not people admit that they are using alcohol to cope with boredom, loneliness and social anxiety. For example: For a shy person, the thought of attending a party and not drinking feels scary. In part 7 of this amazing how to stop drinking program we deal with all these issues head-on. Most people who arrive at this website have countless failed attempts to quit drinking behind them. Many ask about medication to deal with alcohol addiction. I have always believed that taking a drug to deal with a drug problem is illogical. However, knowledge is power, and I want you to make an informed decision. In part 8 I take you through the prescription drugs out there (and more importantly, why you honestly don't need them). A huge concern for people considering a sober life is how they will deal with their friends, family and partner. We live in a strange, broken reality in the western world where everybody drinks poison for fun. Yet, it is the people who don't want to drink the poison who are considered strange. In part 9 we nail all of this peer pressure problem in three easy to follow steps. "Quitting drinking is easy, why I've done it thousands of time," is the famous quote by Mark Twain. The online course extends for 90 days, but the first ten parts are enough to get the vast majority of people back in control. In part ten I give you to the tools to make your new happy sober life automatic. Not having poison flushing around your body 24/7 doesn't have to be a struggle. With what I will teach you here it will become as regular a part of your day as brushing your teeth. Isn't it dangerous to stop drinking cold turkey? While it's true that the most deeply addicted alcoholics. People who have completely lost control of alcohol may have potentially severe withdrawal symptoms in response to quitting. The vast majority of people (over 95%) will not. For the most part, the tales of 'fatal consequences' of sobriety are a story kept alive to keep drinkers in the loop. More information. 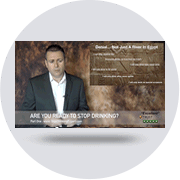 The Stop Drinking Expert program is 100% private, confidential and discreet. No mention of alcohol will appear on your card statement and your data will never be sold or leased to any third party - ever! If you attend a Quit Drinking Event you will find that everything is branded Craig Beck Media and there is no mention of the Stop Drinking Expert name any where. Our secret members facebook group is set to the maximum security setting. Nobody outside the group will see your posts or know you are a member of the group. You don't need to stop drinking until you are 100% ready. There is no willpower involved in this process. If you don't currently want to quit then there would be no point in me trying to persuade you. However, alcohol is making you miserable and causing problems in your life. So why not get started with the program now? If you don't decide to quit drinking completely, you will see a dramatic reduction in the amount you drink. How do the personal and group coaching calls work? 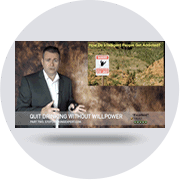 Ultimate & Executive plans come with personal one to one coaching with Craig Beck. As soon as you get started you will be invited to book your first live coaching session. 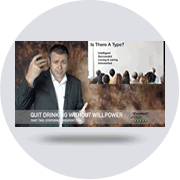 All coaching sessions use an video webinar app called Zoom. It is free to set up an account and the software for your phone, tablet or computer is also free. Click here to get started with Zoom. Group sessions will be announced in the members area and in the Secret Facebook group. They are roughly once a week on a Sunday. They are a chance to share success stories or ask Craig for advice and guidance. Just as soon as you get started you will see that there is no pressure to stop drinking. That decision will always be yours to take. But, remember the saying 'nothing happens until something moves'. That something, on this occasion is you! What do I get & how does it work? I will take you through a unique 5 step process. It works by addressing the foundations that support your alcohol use. Then I will show you how to destroy any cravings. The result of removing the psychological addiction combined with these powerful tools is a totally willpower free escape from alcohol. The process is easy to follow, painless and would you believe enjoyable! Just as soon as you get started you will be granted instant access to the members area. You will find your invitation to join the secret Facebook group and Day 01 of the course. The video course will lead you through the first 10 days of the process and I am on hand every day if you need my personal help.